One of the biggest cities both in Texas and the entire United States, Dallas is located in Dallas, Colin, Denton, Kaufman, and Rockwall counties, stretching out across more than 385 square miles of land and being home to over 1.3 million people, with over 7.2 million in the surrounding metropolitan area. Incorporated in February of 1856, Dallas has been a hugely significant city for the state of Texas for many decades and is the third biggest city in the state, as well as being the ninth biggest city in the nation. It has strong links with the nearby city of Fort Worth and is home to one of the biggest and busiest airports in the world: Dallas/Fort Worth International Airport. Dallas is also home to many major companies, including the headquarters of no less than nine Fortune 500 companies, and is a great place to live and work. It's also a popular city with tourists, attracting millions of visitors from all around the United States and elsewhere around the world each year, with some of its most popular attractions being the Dallas Museum of Art, the Nashar Sculpture Center the Dallas Zoo, the Dallas World Aquarium, and the Dallas Arboretum and Botanical Garden. If you're planning a visit to Dallas and intend on camping out in an RV in this Texas city, there are lots of great RV parks and campgrounds to choose from. See below for details on the best RV parks in Dallas. Located down in the southern part of the city, Good Luck RV Park is one of Dallas' top rated RV parks, with many past guests happily returning to this park time and time again due to the cleanliness of the facilities and the friendliness of the staff. Situated about 10 minutes away from Downtown Dallas, Good Luck RV Park is in a great spot for people who want easy access to the attractions of the inner city while still being able to enjoy a relatively quiet and attractive, tree-lined setting. This is a family friendly RV park that accepts guests of all ages, so it's a good choice for families visiting Dallas, and is very easy to access right off I-35. It's a very clean and safe RV park with lots of useful amenities like restrooms, showers, laundry machines, a play area for young children to have some fun, and even a dog run for your canine companions to enjoy. There are some good local stores and eateries within walking distance as well, so Good Luck RV Park is a super spot to base yourself for trips to Dallas. Situated in the southeastern part of the city in a tranquil and relaxing environment, Lakeside RV offers the best of both worlds: it's only a few miles away from the hustle and bustle of Downtown Dallas with all of its attractions and eateries, while also being set in a beautiful lakeside location without any noise to disturb your stay. 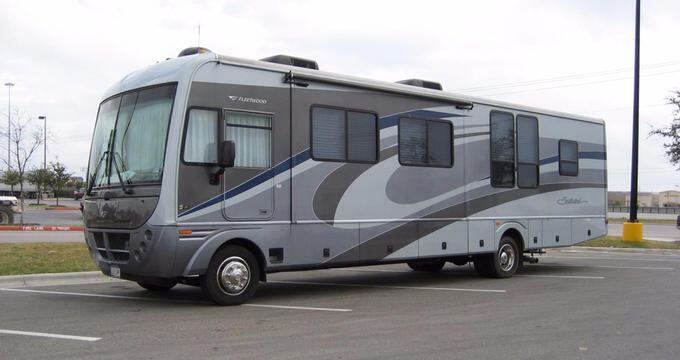 Effectively, this Dallas RV park lets you enjoy the sights and sounds of the city whenever you want, while also having a peaceful haven to retreat to when you prefer a little quiet time. As the name suggests, Lakeside RV is located on the side of multiple large bodies of water, with the full park stretching out across 20 acres in total. There are four ponds in the park, all stocked up with fish to keep keen anglers busy each day. The park is nicely located near some good quality eateries and stores to ensure you have a super stay without any problems. Many of the RV sites in this Dallas RV park offer waterfront views, and the daily rates are just $35, with weekly and monthly stays available at $200 and $500, respectively. Part of the Sun RV Resorts brand of high quality RV parks and resorts, Sandy Lake MH & RV Resort is located in the northern part of Dallas, only a short drive from the downtown area and all of its museums, shops, restaurants, and landmarks. One of the best things about this family-friendly RV park is its location, especially for people who want to explore Dallas without having to make long journeys in and out of the city each day. Another big advantage of Sandy Lake MH & RV Resort is its long list of amenities. There's a round-the-clock gym, large swimming pool, club house, children's play area, restrooms, showers, laundry facilities, concrete patios at most sites, and more at this Dallas RV park. Not only that, but the friendly staff here are always organizing lots of fun games and activities to keep everyone entertained, so you'll always have something to look forward to at Sandy Lake MH & RV Resort.